An Israeli court has for the first time authorised members of the country's Druze community to visit Syria, which is still officially at war with Israel. The judges ruled that Druze religious leaders could make a 72-hour visit. It is the first time since the creation of the state of Israel in 1948 that any Israeli citizens have been allowed to cross the border into Syria. Around 80,000 Druze live in Israel, including 18,000 in the Golan Heights which were captured from Syria in 1967. All efforts to reach a peace deal between the two countries have foundered over the return of this region. The Israeli judges ruled that a group of Druze religious leaders could remain on Syrian soil for a maximum of 72 hours to attend a religious meeting. The court will study the success or otherwise of their trip before making a definitive ruling on future visits, the AFP news agency reported. 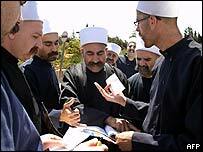 The Druze follow a faith which grew out of an 11th century schism with a branch of Islam. The worldwide population of Druze is put at up to one million, with most living in mountainous regions in Syria, Lebanon, Jordan and Israel. They are the only Arabs, apart from Bedouin, who serve in the Israeli army. How can Syria and Israel move forward?